Preheat oven to 200°C. Bring the water to the boil in a large saucepan over high heat. Stir in the stock powder. Reduce heat to low and hold at a gentle simmer. Heat the oil in a large, heavy-based saucepan over medium heat. Add the onion, celery and garlic. Cook, stirring, for 5 minutes or until onion is soft. Add the rice. Cook, stirring, for 1-2 minutes or until the grains appear slightly glassy. Add the wine to the rice mixture and stir until almost absorbed. Add a ladleful (about 250ml/1 cup) of simmering stock to the rice and stir constantly with a wooden spoon until liquid is completely absorbed. Continue to add stock mixture, a ladleful at a time, stirring constantly and allowing the liquid to be absorbed before adding the next ladleful, for 20 minutes or until rice is tender yet firm to the bite and risotto is creamy. Stir in the peas, lemon rind and parmesan. Season with pepper. Cover and set aside for 3 minutes to develop the flavours. Meanwhile, place the pancetta on a large baking tray. Bake in oven for 8-10 minutes or until crisp. Set aside to cool slightly. Break into coarse shards. 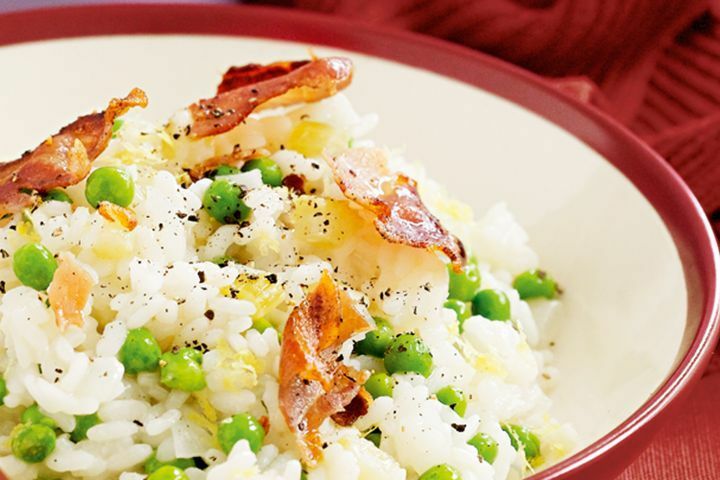 Divide the risotto among serving bowls and top with the pancetta. Season with pepper to serve.